X-Men: The Animated Series' Eric & Julia Lewald reflect on the show that created a generation of X-Fans – AiPT! Since their debut in 1963, the X-Men have sworn to protect a world that hates and fears them. But you know what? Here at AiPT!, we’ve got nothing but love for Marvel’s mighty mutants! To celebrate the long-awaited return of Uncanny X-Men, AiPT! Brings you UNCANNY X-MONTH: 30 days of original X-Men content. Hope you survive the experience… When a franchise has been around for over half a century, it’s a given its fan base will be comprised of multiple age groups. 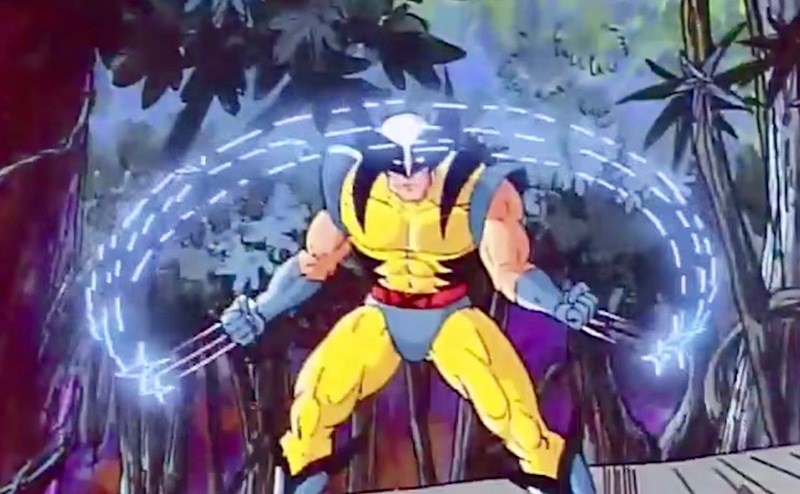 In the case of the X-Men, an entire generation of fans fell in love with Wolverine, Gambit, Rogue and the rest of Professor Charles Xavier’s students on Fox Kids’ X-Men: The Animated Series, which ran from 1992-1997. This also means that same generation of fans owes a huge debt of gratitude to the creative professionals who helped make the cartoon a groundbreaking hit. It’s safe to say X-Men wouldn’t have become such a cherished program without its showrunner Eric Lewald and writer Julia Lewald. The husband-wife creative team behind the recently released Previously on X-Men: The Making of an Animated Series was nice enough to reflect on X-Men with AiPT! and even look to the future of the franchise as Disney and Marvel Studios assume control of its film rights. AiPT! : X-Men: The Animated Series premiered in 1992, and all these years later, you have a book out about the show and you’re making convention appearances. Did you have any sense of how much the X-Men would change your life when you started working on the show? Eric & Julia Lewald: We had no idea. It was simply a good job opportunity to work with people we liked. We were new parents at the time, so the paycheck was welcome. AiPT! : On your website, I saw that Justin Trudeau, the Prime Minister of Canada, is among the series’ many fans. Have any other famous figures spoken to you about how much the show meant to them? Eric & Julia Lewald: The prime minister is the most famous. Among the thousands of people who have told us that X-MEN:TAS was their show are the WWE champion Austin Creed and boxing champion Mike Tyson. AiPT! : For many X-Men fans, the voices from the animated series are the ones they hear in their heads when reading X-Men comics. Looking back on the series, what character or characters do you feel the show did the best job of translating from the page to the small screen? Eric & Julia Lewald: So many of our Canadian cast did so well that it is truthfully hard to choose favorites. We’re not being shy, here. We can’t think of a weak major character voice on the show. Credit here to Fox executive Sidney Iwanter, casting director Karen Goora and voice director Dan Hennessey. As you may know, our first run at casting the show was a disaster. No one was prepared to make a “cartoon” sound as serious and dramatic as we needed. We think that we overcompensated and took the time to find the right voices for our core cast. AiPT! : What episode or storyline are you most proud of? Eric & Julia Lewald: While we’re proud of many of the episodes, I think adapting “Days of Future Past” and “The Phoenix Saga” for television were among the biggest challenges, since X-Men fans had preconceived ideas about these classics. The pilot story, “Night of the Sentinels,” was a real challenge, since we had to introduce this strange world to an audience, 90% of whom knew nothing about it. “Nightcrawler” dealt with faith in a way we’d never seen on Saturday Morning TV. And “One Man’s Worth,” my favorite of our dozens of original stories, was so satisfying that Marvel used it later as the basis for “Age of Apocalypse.” AiPT! : Similarly, were there any storylines from the X-Men comics you wanted to adapt but couldn’t? Eric & Julia Lewald: Many of the writers were fans of the 30 years of the books, and they had favorites that didn’t make it. Believe it our not, we and head-writer Mark Edens were new to the X-Men, so we came in with fresh eyes and no list of favorites. AiPT! : Could you talk a bit about the original character Morph and how he came to be? Eric & Julia Lewald: Morph’s origin is simple but complicated. We needed an X-Men team member to die in the opening story to show that there were stakes to their struggle. In the first draft of the story, this character was going to be Thunderbird (one of the “new” X-Men in the 1975 revival of the book). Then it occurred to someone that killing off the only Native American on the team might not look great. So we looked for a minor character from the books who had actually died helping the X-Men. We found Changeling. We used him for a short time until Fox Network lawyers told us we couldn’t because DC had a character with the same name. So we kept the character, but changed his name to Morph. We had intended to have him truly die, but he proved so popular with our audience that the network begged us to bring him back. AiPT! : I’m curious about Jean Grey’s role on the series. While her Phoenix storylines dominated season 3, she was less prominent in the show’s early episodes. Was there a reason why she took a backseat to other characters early on in the series? Eric & Julia Lewald: There are a few reasons I can think of. First, Marvel listed her as a “secondary character” (Beast too! ), so we didn’t plan big things for her. Second, we discovered that she meant so much to each of the characters, was so central to the team, that we tended to use her support and focus on everyone else. Everyone could talk to Jean. Finally, we were focused on personal and origin stories, which for many of the other characters were more involved and dramatic than hers. AiPT! : I felt like there was a real effort to do more world-building and provide a sense of history in the series’ later seasons. For example, on the episode “Cold Comfort,” we learn that Iceman was one of the original X-Men. From a writing perspective, was there always a greater sense of team and character history, or were those just fun nods to comic book continuity you tried to sneak in whenever you could? Eric & Julia Lewald: When we laid out the first season of 13 episodes, we were in a desperate rush to simply get 13 solid stories finished that let the audience get to know the current team, their world and their challenges. We were just trying to make a challenging show work. Honestly, few people thought we would get to do more than that season (in fact the creative staff was let go for a couple months). Then, when the show became a hit, and more episodes were ordered, suddenly we had time to explore and expand. AiPT! : Old television shows returning with their original casts has become a trend. This is a total fantasy scenario, but if everybody was called back tomorrow to get to work resuming X-Men: The Animated Series, where does the story go from where you left off in season 5? Eric & Julia Lewald: We had never considered this back when we were wrapping up the series–we were on to our next job. But many people have asked, and a simple answer finally came. Season Five ended with a dying Charles going off with Lilandra, to be kept alive on her planet, leaving the X-Men grieving and leaderless. The natural thing would be to start six months later. The team, missing its leader and inspiration, would be in disarray. Could this be the end of the X-Men? Then there is a distress call from Lilandra about Charles. The team gathers to go help their leader. The challenge rekindles their spirits. They fight valiantly to help Lilandra save Charles, but in the end, Charles Xavier sacrifices himself for his team and his love, and the X-Men return home healed and together again. AiPT! : Finally, with the X-Men film rights in Disney’s hands, it looks like Marvel Studios will soon reboot the franchise as part of the Marvel Cinematic Universe. As you successfully introduced the complex world of the X-Men to a generation of fans, what advice do you have for distilling decades of rich X-Men history into something fans old and new can enjoy? Eric & Julia Lewald: First of all, we are thrilled that the X-Men and Marvel are finally getting back together. The last dozen years of Marvel downplaying the X-Men because Fox owned the movie rights has made it awkward to find a way to work with them. Now they are on board 100%, and with the 80th year of Marvel Comics coming up in 2019, we look forward to a new Marvel-backed celebration of our beloved team. As to what worked for us: character stories. Not spectacle, not battle royals. While always making sure to display the powers and action inherent in the X-Men’s world, we always chose personal stories. AIPT! : And it was much appreciated. Thanks for taking the time to talk, Eric and Julia!